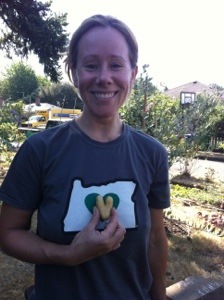 So summer has arrived in Portland. Meaning today, basically. It’s been rather chilly in the mornings the last couple of weeks, with mildly cloudy days or slightly sunny. It’s my second year gardening here, and I’m pretty unhappy about a few items, but ecstatic about others. Take my squash for example. I know I can’t blame the weather for the small size of my plant, or the lack of bees (just the opposite!) for not having any viable fruit yet. My tomatoes are also lackluster. 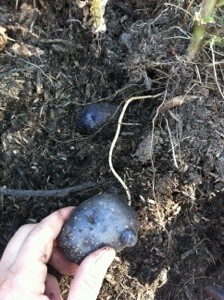 Not as large as last year; one plant doesn’t even have fruit yet. Today I had all morning to work in the garden, and my plan was to follow the philosophy that I can’t add without subtracting. In other words, we planned to build a new bed today, and add irrigation (finally). These projects are extremely exciting for me. But I knew that my existing beds needed some care, so I decided to focus on that first. 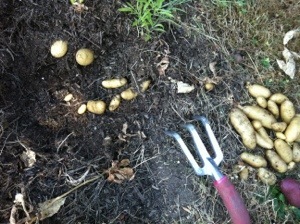 Weeding and shaping aside, I set upon digging up the potatoes. Success! 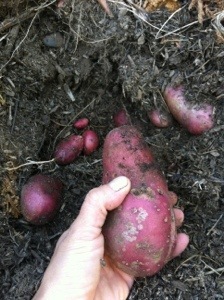 Planted back in March, I now have a bounty of beautiful fingerling potatoes. 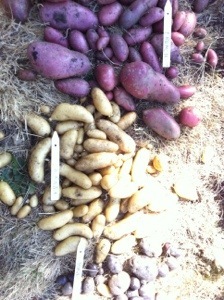 All but the Peruvian Purple did extremely well. That pretty much made up for my crap squash and tomatoes. Well, there’s still two good months left to see. Those chores complete, I then added a triangular addition to Bed 3, and though its late in the season, I got two healthy tomato plants from the Woodsman Tavern Market for $5. Added some basil to make friends. The ground is too hard to dig up, so I hope the sheet mulch job and new compost from Mt Scott Fuel will do the trick. Here’s a snapshot of what’s happening around Lozano Farm. 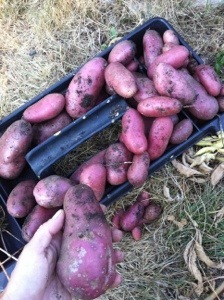 So many French Potatoes! So big! Who knew! 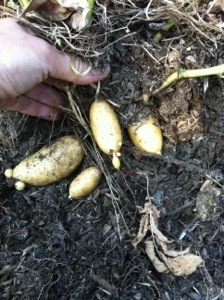 Finding potatoes in the ground is like Christmas. I was so excited this morning. Here are the La Ratta blondies. These guys didn’t do as well. Peruvian Purple. 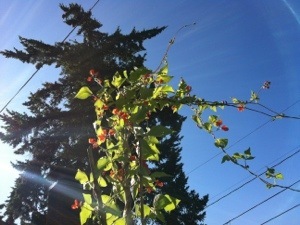 Scarlet Runner beans are reached out to the sky. 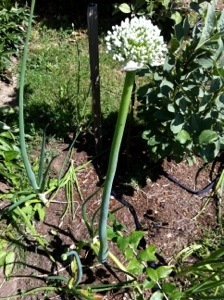 Onions, “Copra Bunching” planted in February are blossoming. Too pretty to pull.